Bishop Robert Vasa delivers pearl rosary made in Oregon to Pope John Paul II in 2004, a year before the pope died. 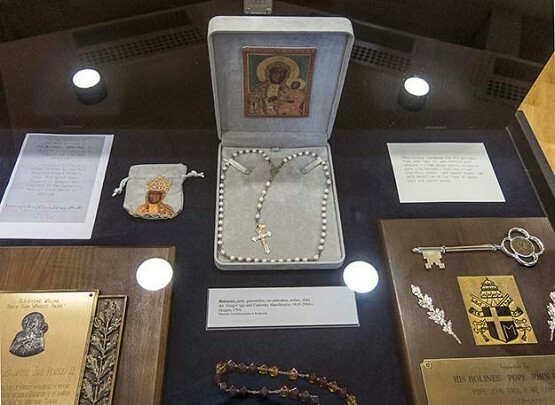 The Oregon rosary is on display in the Archdiocesan Museum of Saint John Paul II in Krakow. A cake named for a saint, a pearl rosary made in Oregon – both can be found in Krakow, Poland. Each year on May 18, I bake a special Polish cake to celebrate the birthday of Karol Wojtyla. St. John Paul II was canonized by Pope Francis three years ago. As a boy growing up in Poland, Karol favored a cream cake called kremówka (kreh-MOOF-kah). During my search for the recipe, I discovered the cream cake has a new name. Bakeries in Krakow, and now all across Poland, call the beloved dessert Kremówka Papieska, Papal Cream Cake. And that’s not my only recent discovery about new things in Krakow. Some dear friends of ours went on pilgrimage in Poland last year to visit the Archdiocesan Museum of Saint John Paul II, located on Totus Tuus Street in Krakow, when they found a special pearl rosary belonging to the pope that was handmade in Portland, Oregon, on display there. “A gift to the Holy Father for his 84th birthday,” the placard said. We had often wondered what happened to that rosary, but never imagined it was on a decade-long pilgrimage, traveling from Portland to Rome, making its final stop on its pilgrimage in Poland. “Do you think he’ll eat any of those?” my husband said. Probably not, I was thinking. “How about a rosary? He gives away all those rosaries, but how many rosaries do people give him?” I said. It was settled. That weekend I began my search for 59 pearls. I was pretty nervous that an impossible task was ahead but found comfort in a quote from Mother Angelica: I want you to get good ideas, crazy ideas, extravagant ideas. Nothing is too much for the Lord — accent on the Lord. So, I prayed. Cheryl excused herself, saying she had someone she wanted me to meet. She returned with her manager, whose last name was actually Pope, and a jeweler named Ruth, “The best pearl stringer around,” Mr. Pope said, introducing his jeweler. They offered to make the rosary for us. I’d already collected enough silver spacer beads from a local bead shop and ordered a silver crucifix and medallion of Our Lady of Jasna Gora from the local Catholic gift shop, and Ruth set to work. The completed rosary was beautiful, and it had touched the entire staff at the Tigard jewelry store. Now it was ready for a trip to Rome in the hands of Bishop Robert Vasa, Bishop of Baker at the time, who was going to Rome for his ad limina visit just in time for the pope’s May birthday. The bishop emailed us after he met with the Holy Father. 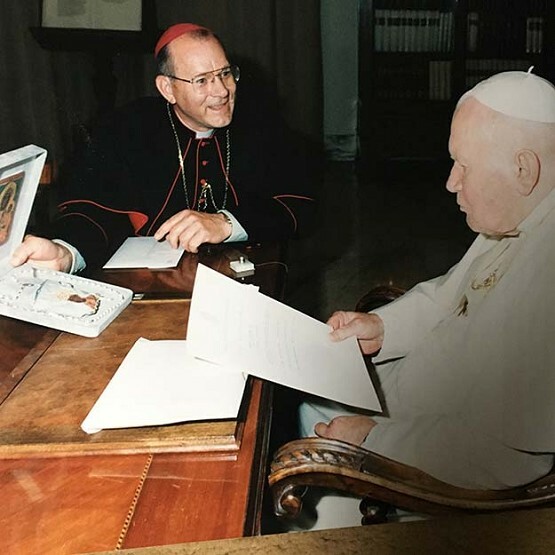 “I mentioned your names as connected with Physicians or Compassionate Care and the Holy Father nodded and repeated ‘Hamilton,’” Bishop Vasa wrote. And he sent pictures. We got a thank-you card from the pope’s secretary and that’s the last we’d heard of it — until our friends called and said, “We found Cathy’s rosary.” It was in a room featuring Pope John Paul II’s personal affects. Thanks to Tom Pitre and his wife Lynne we have pictures. How amazing is that? Maybe next May we’ll have Kremówka Papieska in Krakow and visit theMuseum of Saint John Paul II ourselves. The writer is a Catholic freelance writer of Polish descent and a Benedictine Oblate; she lives with her husband in Portland, Oregon.